Photos, videos, and stories don’t ever fully prepare a person to step foot on foreign soil. Though one might be used to a similar climate, the air always feels a little different and the birds and insects sing songs your ears have never heard. What always strikes me first about landing in a new country is the way it smells. Tanzania certainly has its unique flavor that leaves my senses marveling at the sights, sounds, smells, taste and touch that one can only breathe in to really understand. Once on the road, the foot traffic is captivating. Men, women and children walk – often without shoes – carrying buckets of water, babies, bananas or great bushels of other crops atop their heads. Some are empty handed, and the foreign traveler is left wondering where they are going or who might be waiting for them at home. I’ve questioned countless narratives in my head about those I see walking along the Tanzanian roads. I wonder where a torn shirt came from, or when the last time it was washed. I wonder how long it takes that group of kids to go get water and if they boil it before drinking. I wonder how much they get to drink each day. I wonder how long ago that small child started walking on the long, dusty roads alone. The one thing I never question about the Tanzanians is their effortless and unabashed expression of joy. In passing, the typical Tanzanian stares in earnest at the light-skinned woman staring back. But, when I smile at them, their faces light up and they are quick to smile in return. When I get out of the car to meet them, they touch me and laugh with me and expose me to pure, unadulterated love. Christ’s love. Of course, I have arrived with the mzungus (Caucasians) who bring the promise of safe water to their village. But even on my last trip in 2010, when I visited the villages with a medical team to provide care for the sick, their unceasing joy was also present. I am amazed at how these people can have so little: one shirt, maybe a pair of shoes, very little money, no safe water; yet they carry with them so much joy. The answers I sought on this trip lay in the 35 villages where our teams have dug wells. The answers were with the women and children who now have two to four extra hours every day, because they no longer have to walk long distances to collect their daily water. They now use the time to do things like tend their crops, sew garments to make some money and take care of their families. The children likewise have stories to tell about the lessons they’ve learned in school, because now that they don’t need to travel long distances to fetch water they can attend more often and aren’t too tired from their morning journey to pay attention in class. Their daily lives are very simple. But a safe water source close to home makes an incredible impact in each and every one of those days. There are stories I didn’t get to hear on this trip. I didn’t hear stories about the village where everyone was infected with intestinal worms, or about the young girl that was abused coming home late from fetching water, or about the young boy that died the previous week from malaria. Every sixty seconds, a child dies from preventable water borne illness. Yet, the Tanzanians continue to carry dirty water atop their heads and boundless joy in their hearts. Maybe that’s something you have to see and feel to really understand. My prayer is that you hear their stories and look at the work our teams are doing to change their lives. My prayer is that there is change in your heart, like there has been in mine. I pray you choose to share more joy, share more love, and share more life. Water is life. If you’re interested in learning more about this project, visit Mission Is Possible, or email me. I’d love to tell you more about it. I’d also love for you to join us on May 11 at our Wine for Water event in Irvine, California. I’m quite possibly one of the most easy going travelers ever. I’m comfortable with discomfort, I’m excited by the unknown and although I meticulously plan things on the home front, when traveling, I relish in submission to the ebb and flow. Life is an adventure, and when we leave the comfort of our homes and the familiarity of our own areas, the best experiences unfold. Day two (of free time) in China did not disappoint. We stepped out of our [ridiculously challenging to find] Airbnb to this ridiculously amazing street vendor, who was making our breakfast. 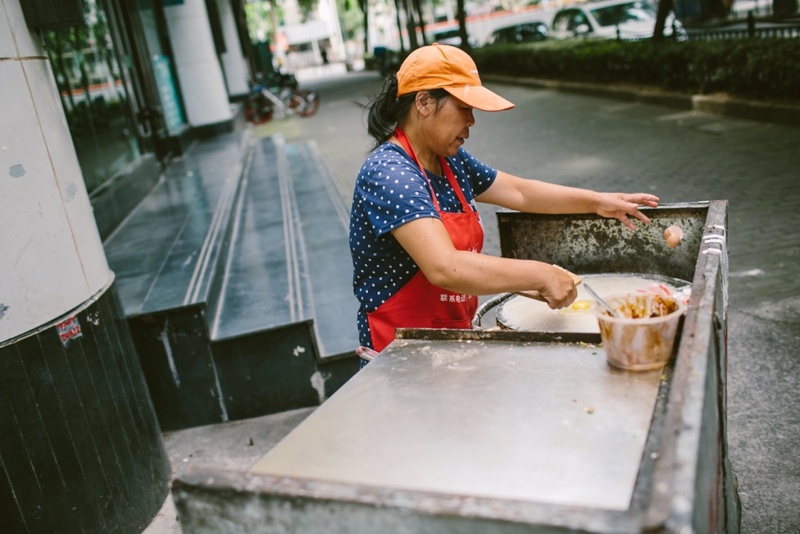 She spread a thin layer of batter over a hot griddle, cracked an egg, sprinkled green onion, garlic and chili paste, rolled it up into an empty burrito, cut it in half and handed it to us. It was the most amazing crunchy, chewy, flavorful thing I think I’d ever had. And so simple! And maybe 25-50 cents? I wish I had taken a photo of it finished but it was too quickly devoured. We returned to her the next morning for round two. 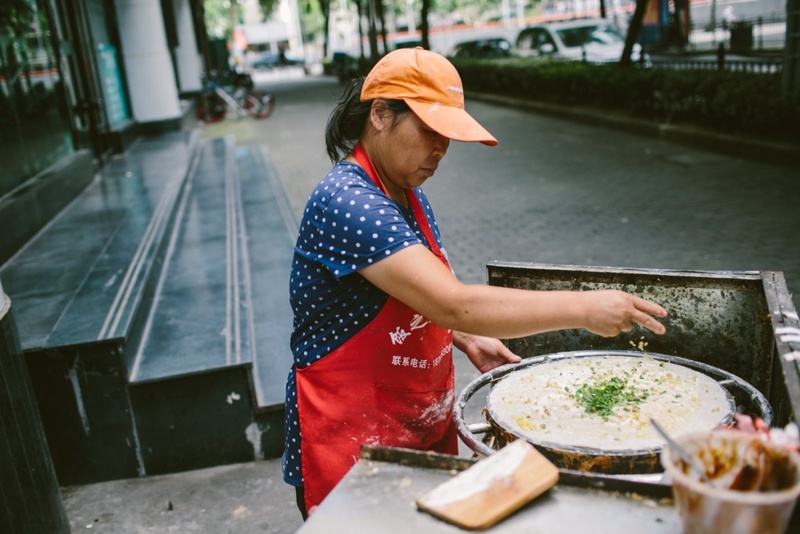 With food in hand, we set off on foot to explore our new neighborhood, eat, drink, smell and just be in Shanghai for a day. It was so interesting observing people’s activities on a Tuesday. Men sitting outside talking, vendors inside working, people enjoying card games in the park, and so many people walking. Of course there are plenty of vehicles in China, but the Chinese enjoy daily exercise and walking is an essential element. I was thankful to take part in it that day and explore such a dynamic yet simple city. Here are some of the observations I captured. The hallway of our apartment, 6th floor. People (wisely) use these little front jackets while they ride their scooters. It covers their arms and sometimes chest to protect them from rain, bugs, whatever on their ride. I just loved all the men sitting outside. How long had they been there? What were they discussing? What did they do for work? Almost every Shanghai restaurant has a trash can beside each table so that people can throw away bones, wrappers or whatever else they need. So practical. A man washes something on a street corner. What is he washing? Why on the street corner? Where does he live? This guy was making noodles! He’d swing them and slap them and swing them again. I want some now. Adam lived in Shanghai for a year several years ago. This was a bar he used to frequent, though it was closed. People had all sorts of birds and crickets in cages hanging on the sidewalks. Eggs boiled in soy sauce. A huge group of people were playing cards in the park. We stood and watched for awhile. Some groups got animated and excited. Most were quiet and serious. Before the sun set, we stopped at this specialty coffee shop for an espresso. After our experience at the Indie Coffee Fest and learning about Chinese culture and how they look at process and technology, we are excited about the future of specialty coffee in China. Hopefully to return for more soon! Javier Larios - Hi Ms. Lovato!! I just read your blog and loved it!!! 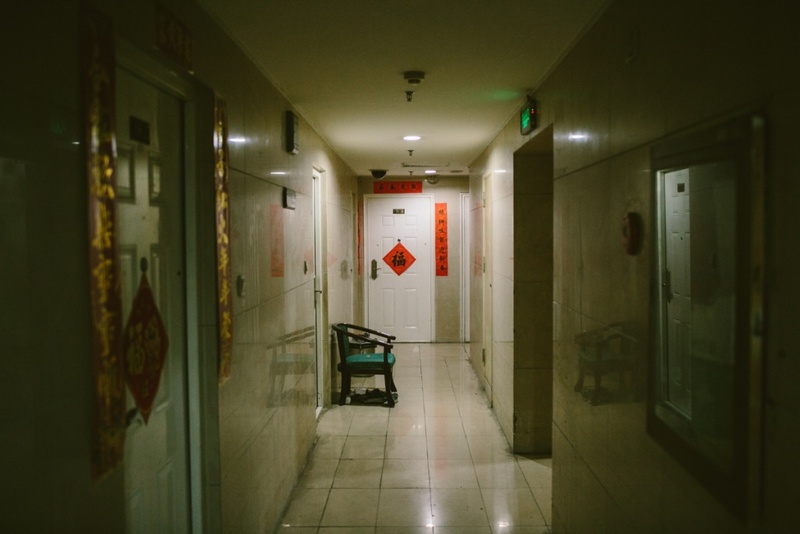 Loved your intimate pictures of Shanghai!! Alright ya’ll asked for it — you’re gettin it! Offered on October 26 and 27 ONLY! Booking begins this Friday, September 28 at 3pm. $150 for a 25 minute portrait session with up to 5 people on October 26th or 27th only. Available times are listed below; locations in Orange County TBA. Mini session includes 3 digital portraits (high-resolution jpeg files) that you select and receive during your ordering session on November 7 or November 8. Booking begins this Friday, September 28 at 3pm. Time slots are filled on first come, first serve basis by email request to info@lovatoimages.com. Mini Sessions are available October 26 and 27 only. Booking is done via email to info@lovatoimages.com and is first come first serve until all time slots are filled. A $50 deposit via Venmo is due immediately to reserve your confirmed time. The remaining balance is due in cash on day of session. Additional people or pets are $25 each. High resolution jpeg images are delivered after your follow up ordering session on Nov 7 or 8 only. It is $50 additional for an online gallery to order from home if you are not able to make it to your ordering session. Mini Session includes 25 minute session and 3 high resolution jpeg image files, printable up to 8×10 with printing rights. Additional files and prints can be purchased during ordering session. Please request your session time after 3pm on September 28 via email, then remit Venmo payment immediately once your time slot is confirmed.